With the invoicing module you can configure the invoicing of your clients. You can create several Service levels, to which you tag certain products with a price. 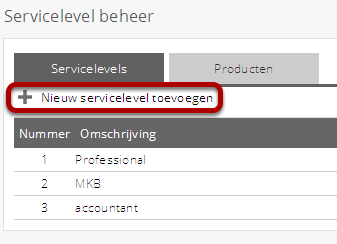 You can then tag a service level to your debtors. You can therefore specify several service levels with your debtors. After completing a run for a company with a created service level, all specified products are counted. 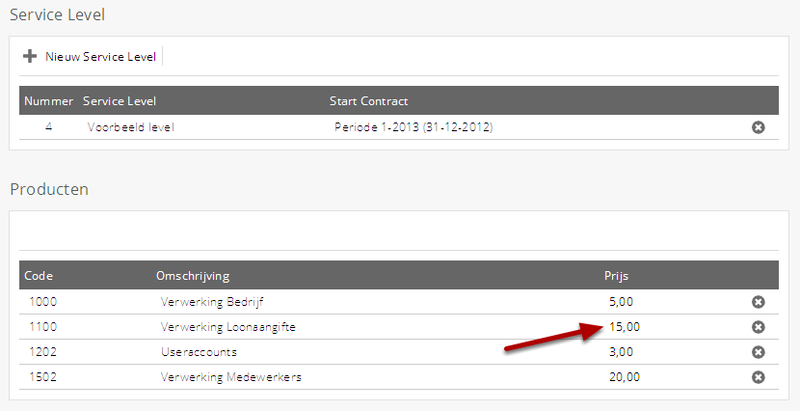 You can then see in the invoicing overview how many products your client has purchased and at which price. The total price for the company is then also specified in the invoicing overview. This page is a guide describing how you create your products and service levels, tag them to a debtor and finally, how to view the invoicing overview. Please note: It is not possible to delete a service level once it has been assigned to a debtor. Go to 'Products' to select the products you want to invoice to your client. Here you can see an overview of products which can be used at the moment, click on 'Add Product' to use more products. You can then edit or change a new product here. At 'Counter', you will find a list with possible products; you then specify a product code as well as a description you want to add. When you have added all the products you want to invoice to your client, go to 'Service level management'. To add a new service level, click on 'Add new service level'. Give the new service level a distinctive name. With this description, you will tag this Service level to your client later on. You can change the prices of the products per service level in two different ways. By clicking on the 'Products' tab and selecting the correct level (1) or by clicking on 'Edit products' after the name of the service level (2). Click on 'Select products' to select which products you want to use for this service level. Select the products you want to use. You can add a price by clicking under 'Price' behind the product. You can also adjust these prices. It is also possible to enter different prices for a debtor, this will be explained later on this page. Enter the correct price you charge for the product, for instance for the processing of the Wage tax declaration. Please note: a scale which charges lower prices as the number of slips increases, is not supported by Nmbrs®. A price can be indicated per segment of a number of payslips (for instance, between 1 and 10 slips) but not, for instance, for a lower price per slip when a client has a total of 11 payslips out of the total number of slips. The 11th slip can then be remunerated against a lower tariff, the first 10 slips will always fall within the same price. Linking a service level to a debtor is done via the 'Explorer' tab. You can adjust the service level at the debtor level. Create a new service level at the client. Select the service level you want to add to the debtor, add a start date of the contract and save the information. You can change the price here at debtor level, you can do this, again, by clicking on it. This price for the product is then only charged for this debtor. Please note: you change the price for this debtor only, the price for the service level remains the price you have entered earlier via the 'Settings' tab. We recommend that you do not change the price again after the first snapshot has been taken, as the price will be changed with effect of the first period. You can create a snapshot for the invoicing via 'Invoices' on the 'Start' tab. 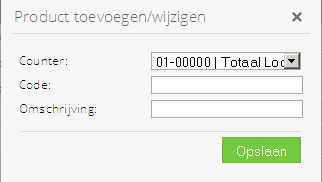 Click on 'New snapshot' to create a snapshot for the invoice. Select the year and the period. Select the period in which you want to create this snapshot. Click on 'Details' behind the newly created snapshot. Here you see the details of the snapshot for the invoice. 1. Here you can select the debtor and the display. Display - Latest: Shows results of the latest snapshot over each period. Display - Corrections: Shows the difference between the latest and the previous snapshot. For previous periods it shows the differences and for the last period it shows the exact results of that period. If you want to see the display from one period only, you have to select the 'Corrections' display. 2. Here you see once more the costs that you charge and how much use has been made of the products, this is shown per period. 3. Here you see the total costs per period. 4. Here you see the total costs per year to date. 5. 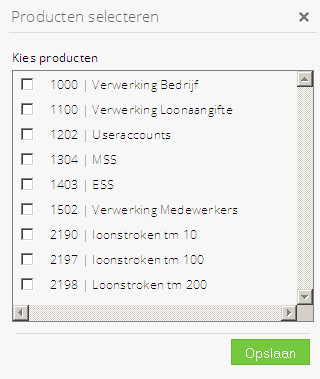 You can export these data to Twinfield or to Excel. 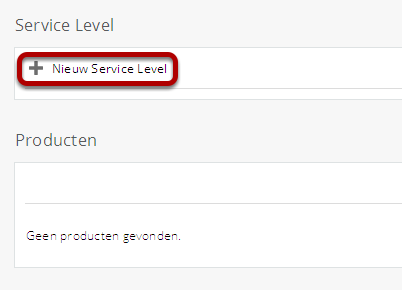 If you invoice the client via the invoicing module offered by Nmbrs, you have to add a new service level at the highest level. You can call this 'Discontinued' for instance, and you will not add any products. It is an 'empty' service level, which you can activate at debtor level under 'Service level' per the period in which the administration is discontinued. When a client has been discontinued, he will continue to return in the snapshot for the entire year in the newly 'discontinued' service level. Only after year end, this client will no longer be included in the snapshot.